in Destiny 2‘s most recent major seasonal update, The Season of the Forge & Black Armory, players can take on quests that will reward them with powerful weapons and equipment. One of the objectives early on is to get a weapon core, here’s how to do just that. A weapon core is needed to complete an objective for the machine gun frame and possibly other Black Armory weapon quests. It tasks you with going to specific area, and finding a special cache that will contain the weapon core. On Earth for example, you need to head out either to the Outskirts or the Gulch. From there, you’re looking for a Saboteur enemy. 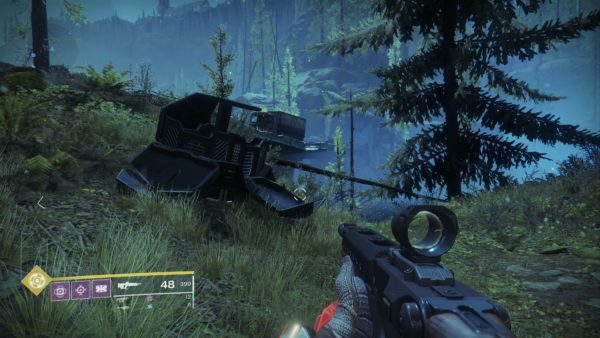 These are powerful major enemies that can drop new Black Armory weapons. However, from our experience, they also tend be located near where the cache is located. The picture below will give you an idea of what you’re looking for. We have not yet discovered every single possible spawn location, or if there even is a set spawn location for the caches, or if they are just placed at random. In sum though, our recommendation is first obviously head to the right location which will be tipped off to you by your quest objective. Then, start looking around and if you see a Saboteur take it out, and check around the surrounding area. When you find it, don’t dally, get to it ASAP get your weapon core and then move onto to whatever your next step is. That does it for how to get a weapon core in Destiny 2’s Black Armory update. Once we have more information about the best ways to get weapon cores, we’ll be sure to update this post accordingly. Happy hunting and forging! Be sure to check out our wiki guide for more tips and tricks on the latest Destiny 2 updates.